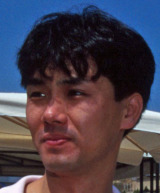 Taki Inoue raced for Simtek and Footwork in 1994 and 1995 but didn't make a lasting impression on the paddock with his driving skills. He failed to shine in junior formula as well and when he finally did reach F1 he retired from far more races than he finished. He will most likely be remembered for a couple of bizarre incidents involving course cars. One of which saw his Footwork flipped at Monaco while being towed back to the pits and the other ended in him being run over by medical staff. He continued to race in the occasional sports car event but never achieved anything to prove his F1 critics wrong.